I have this Pinterest board that I call “I’m So Crafty” where I keep a catalog of all the pins that are craft ideas and lifehacks to make routine chores less mundane. There are a few DIY projects in there, some organizational tips, and a handful of projects that I will probably never get around to, stuff like that. 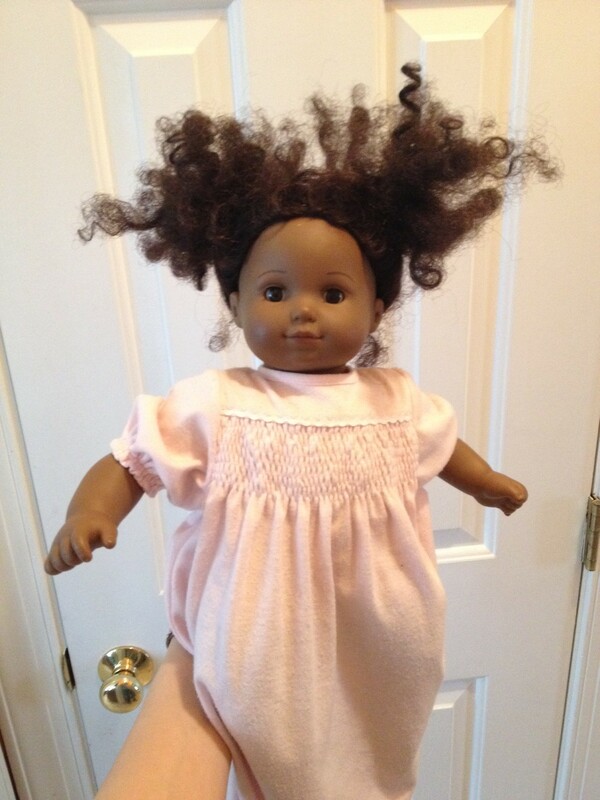 This is Mo’s American Girl Doll Bitty Baby. She’s had this doll for about four years and her love for it has ebbed in flowed in that time. If I had to guess, I’d say that the amount of love shown to this doll is directly proportional to the ease Mo has when trying to brush this doll’s hair. The easier the brush moves through the hair, the more she plays with it, the more she loves on it. There’s not been a whole lot of hair brushing going on as of late and this doll has been relegated to the bottom of the toy bin. I thought if I could remedy the situation with the hair, maybe that would rekindle the romance for Mo and they’d be BFFs forever. Which brings me to my foray on Pinterest — I wanted to find a doll hair de-tangler recipe so that I could alleviate the knots and tangles in this mane. I found so many variations, complete with color photos of before and after shots on how well the treatment worked. 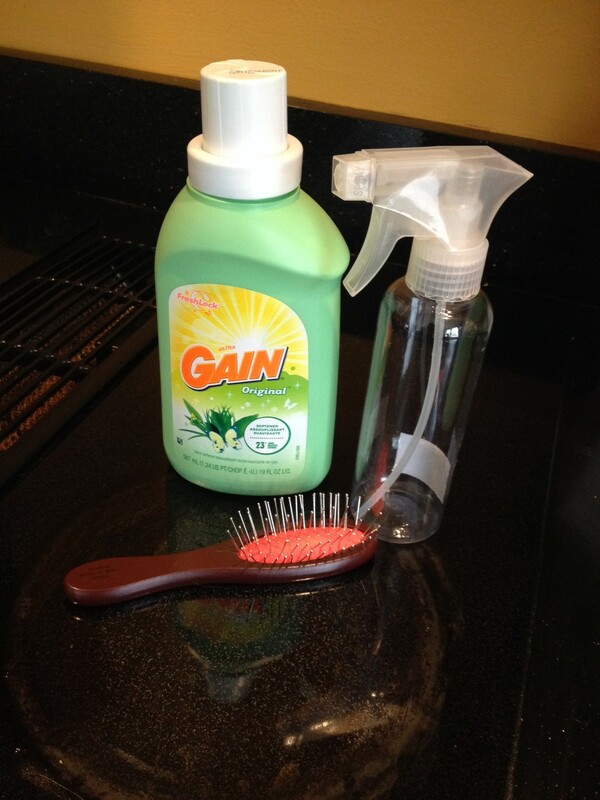 The recipe called for one part fabric softener mixed with three parts water in a spray bottle. Spritz the offending tresses and then brush your way into tame locks. Fabric softener? Check. Waterbottle? Check. American Girl Doll hair brush where I thought it would be when I needed it?! Check. Let’s do this. Now, before I continue, let me just make the observation: Of all the pins that I saw related to this doll hair de-tangler, none of the pins – NOT ONE – had an American Girl Doll getting her ‘do done. They were mostly Rapunzel dolls or Barbie Styling heads. In my estimation, doll hair is doll hair. I whipped up the water/fabric softener cocktail and got down to business. 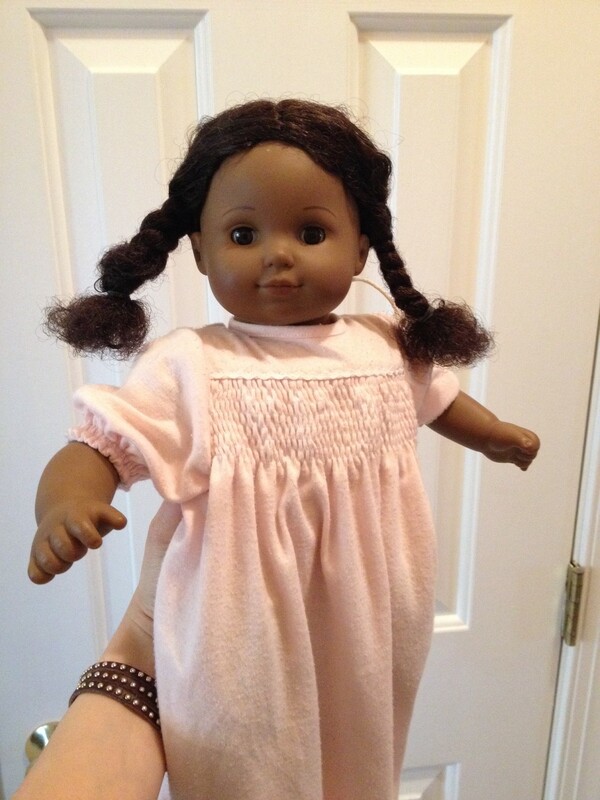 There’s a reason why there were no American Girl Dolls in the pins with the doll hair de-tangler. See, it wasn’t until I was brushing out clumps of sweet mountain lake scented wet doll hair that it occurred to me, “Hmm, maybe I should have looked up how to care for this hair on the American Girl website.” So, with soggy fingertips, I Google searched American Girl Doll hair car on the iPad. Not great, but not bad. I had already filled out the paperwork to send her to the American Girl Doll hospital for a “wellness check” and “hair styling” (i.e. swap out the old head for a new one), but Mo was happy with the way it came out. “Her hair looks like exactly mine!” she exclaimed. Looks like there’s going to be some deep conditioning and hot oil treatments all around tonight.